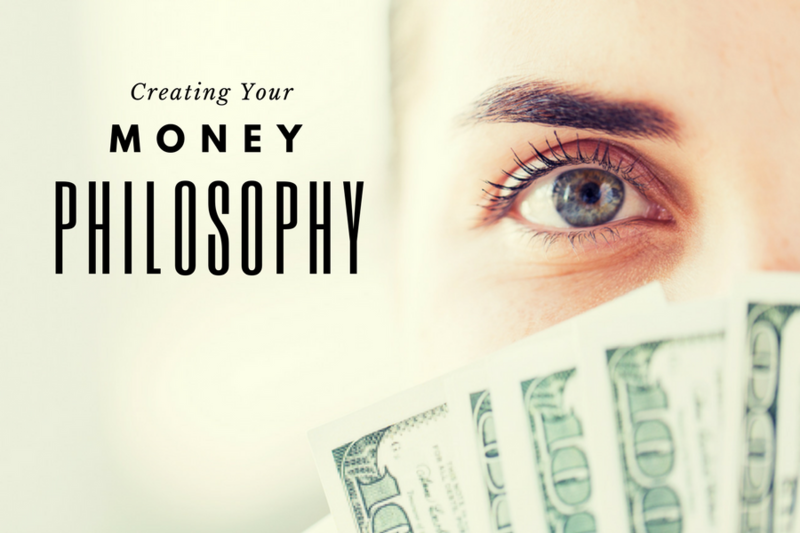 Thoughtfully & intentionally creating your money philosophy. Most of us get stuck with some weird distorted hand-me-down version of this from our parents – the same people who, no doubt, also taught us that Happy Meals were an actual food group or that “tails” were totally the bomb hair-style when you were 8. Somewhere down the road good ol’ mommy & daddy’s money issues became our own, or if we were so smart to out-smart the parents, then we adopted the opposite money philosophy, usually about as deadly to our financial health as the ones our parents actually raised us to believe. Either way, the most of us are ‘OOOOH’ for 1. My mentor, the brilliant Brooke Castillo on her podcast, gave me this idea and I have expanded on it in my own little way. So I’m going to guide you on getting started and really thinking through your money philosophy and I actually encourage you to write this down. Yet, oddly digs deep and uncovers more of those dang money blocks! AND it gets you to think for yourself and what works for your life. You can’t really cheat – if you copy your neighbors answers on this one it will leave you miserable and unfulfilled, and this done right will do the opposite for you – uncover your MONEY brilliance! What are your baseline minimums when it comes to money? What is the minimum you will keep in your bank account at all times? What is the minimum you will earn each month? What is the minimum you will save/invest each month? What is the minimum you will spend each month? What is the minimum you will tip when you go out for services? What is the minimum star-rating hotel you will stay at? What is your minimum quality of life your will have? Creating a minimum will help you determine the absolute lowest standard you will be able to live with, and then you can go about increasing it as needed. Minimums give you a standard that you have to live up to and by constantly being in integrity around what is acceptable to you and what is not acceptable to you, and keeping your word to yourself you actually elevate yourself to the next level! You feel proud of yourself for at least accomplishing the minimum. I encourage you to take baby steps here. Start small. What does money mean to you? List 5 words to describe what money means to you. I got this question from my favorite money badass, Jen Sincero. Look up her books amazing! This is where the rubber meets the road always. What are you working toward that is bigger than just you? What are you doing to increase the good vibes on this planet? What makes you feel alive? What makes you feel like you are a 15-year-old in love for the first time or like the time you finally allowed yourself to make love to some carbohydrates after a year in the Keto desert? Are you tuned into it? Have you even sat still for 5-minutes to contemplate what this really is and then chosen to live you life by letters of your own law? I could go on and on about what to include or think about when creating your money philosophy, but this one’s on you. Create the MoFo out of your Money Philosophy and then make in non-negotiable. PS. For all my soulpreneurs in Wealth Spa, make sure to go to the membership site to download the Wealth Sheets that go along with today’s blog!